There is nothing like homemade pasta. Contrary to popular belief making pasta from scratch is relatively simple. All you need is a little bit of patience and a touch of magic to prepare real pasta like an Italian. Try our traditional family recipe and you will never buy ready-made pasta again! This step-by-step recipe is how we make pasta at our cooking classes and is a failsafe way to get perfect egg pasta every time. Try making traditional egg pasta and you will be surprised how easy it really is. The recipe is for 1 person. Just multiply according to how many hungry mouths you need to feed! In a bowl, combine all-purpose flour with a pinch of salt and whisk together using a fork. Create a well in the middle of the flour and add the egg. Gradually work the flour into the eggs from the outside inwards. Once the dough begins to shape, empty the bowl onto a clean work surface. Use your hands to knead, pushing into the mixture with the heel of your palm. If the dough becomes sticky, add a little more flour. When the dough feels silky smooth and stretches without breaking, after about 10-15 minutes, cover with plastic wrap and leave to rest for at least 30 minutes. Once rested, use a pasta machine to roll out the dough and make your favorite pasta shape: fettuccine, ravioli, lasagna sheets, tonnarelli, and more! Whatever the shape, start with the same procedure. Divide the dough into 4-6 parts. It will dry out quickly, so use one piece at the time and keep the other pieces covered with a clean cloth or plastic wrap. Sprinkle your work surface with flour. Always start with the widest setting of your pasta machine. Flatten the piece of dough into a thick disk, dust it with flour so it won’t stick to the roller, and feed it through the machine. 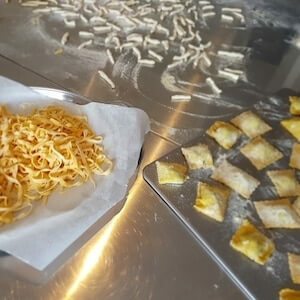 Then fold the rolled dough in half or into thirds and put it back through the pasta machine at the same setting. Repeat this procedure another 2 times as it helps to strengthen the gluten in the flour, giving it a firmer texture when cooked. Gradually change the setting of your pasta machine to a thinner setting until the desired thickness. Place the completed pasta on a semolina-floured work surface and leave to dry out slightly. Start again with the remaining pieces of dough.